Sometimes the simplest ideas create the most fun for children. This was an unplanned project that started because one child painted her hand. I had put a very large sheet of paper on the wall in case someone wanted to do an oversized painting. When I saw the child paint her hand I suggested she make a mark on the paper. This quickly became a frenzy of hand slapping, euphoric painting. The whole class immediately wanted to participate so we set up a station where the children could paint their hands. Simple tempera paints were used and drizzled directly from the bottles to the palms. 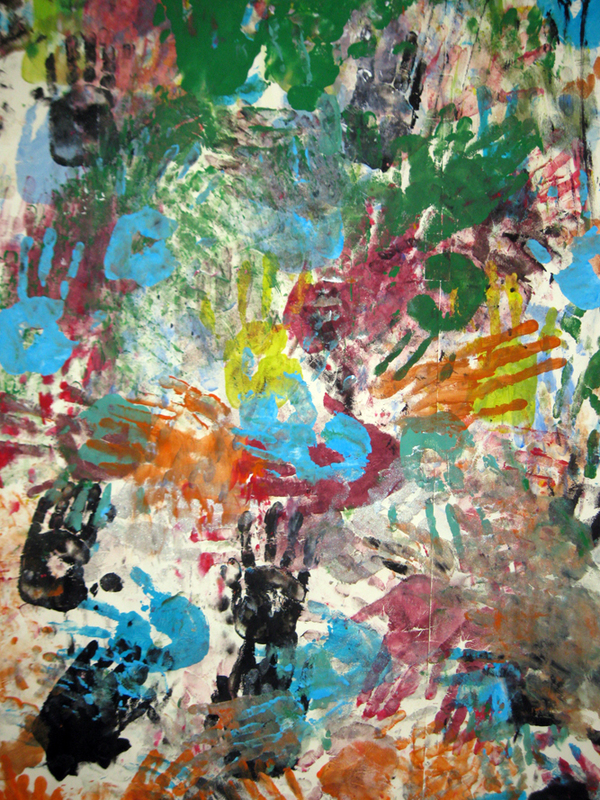 The children enjoyed looking at their hands and they smeared the new color with the previous color creating new hues. They also marveled at the painting itself as each new color handprint was added.